The 2019 Audi A7 is offered in three different trim levels; Premium, Premium Plus and Prestige. All trims come with a new 3.0L turbocharged V6 engine, which is capable of 335 horsepower and 369 pound-feet of torque and paired to a 7-speed automatic transmission and quattro all-wheel drive. Audi claims it can make zero to 60 in just 5.2 seconds. Audi Drive Select provides drivers with various driving modes to adapt to individual preferences — Comfort, Sport, Auto and Individual. Each setting modifies the feel of the steering, transmission shift points and the way the throttle responds, all to meet certain driving styles. Combine this with dynamic all-wheel steering, which allows the rear wheels to steer, makes handling of the A7 becomes second to none. The interior of the new A7 brings on new styling, advanced technology and high-level comfort. Available individual contour seating features 18-way power seats with massage, heat and ventilation. Ambient LED lighting throughout the interior allows drivers to change colors to suit their mood. And a premium audio system, dual touchscreen infotainment and Audi MMI -Multi-Media Interface — touch response allows drivers to customize settings for their driving experience inside the cabin. Navigation is powered by 3D Google Earth, which allows drivers to see topography and terrain in addition to the tops of trees and rooftops of buildings. Audi Connect allows the A7 to become a wireless hot spot, which is capable of connecting up to eight WiFi-enabled devices to the Internet. The A7 Premium trim offers a long list of standard features related to performance, styling, technology and safety. Highlighted standard features include 19-inch wheels, LED headlights and taillights, panoramic sunroof, 3-zone climate control, LED ambient light, 8-way leather heated seats, 7-inch driver information system, dual infotainment touchscreen displays, navigation, Apple CarPlay and Android Auto, 10-speaker audio system, rearview camera, keyless entry and start/stop, adaptive cruise control and Audi Drive Select. The Premium Plus trim adds a Bang & Olufsen 3D 16-speaker sounds system, wireless charging, Audi side assist and pre-sense, 360 view camera, HD Matrix headlights, headlight washers, and Audi virtual cockpit. Audi virtual cockpit is a 12.3-inch color LCD screen, which offers two modes for viewing driver information. The Premium Plus allows for several more option packages to be added including the S Line Package, Warm Weather Package, Driver Assistance Package and Individual Contour Seating Package. The top-of-the-line Prestige trim brings the most to the A7. In addition to what is in the lower trims, the Prestige adds a head-up display, power soft-closing doors, 4-zone automatic climate control, Ambient multicolor LED interior lighting, power rear window sunshade, dual pane acoustic glass, heated and ventilated power front seats and even more option packages. Additional option packages for the Prestige include the 21-inch wheel package and Adaptive Chassis package, which includes adaptive suspension and dynamic all-wheel steering. The Audi A7 gets a full redesign for the 2019 model year. The exterior design keeps to the original A7 foundation but adds sharper lines and a more defined look. A long hood and tapering rear roofline give the A7 a sporty look. Inside, technology takes front seat, with multiple color displays, reduced number of knobs and interactive functionality. A new powertrain consisting of a 3.0L turbocharged V6 and a 7-speed transmission is also introduced for 2019. 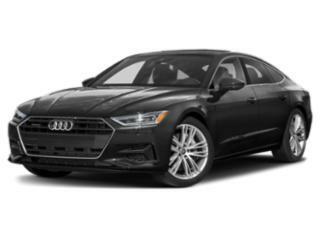 The 2019 Audi A7's design is truly standout in the market of luxury sedans. Adding in the breadth of available technology and luxurious interior design, makes it a highly impressive choice among competitors. When compared to vehicles such as the BMW 6-Series or Mercedes CLS-Class, the A7 is a strong competitor with its performance and style. Audi's quattro all-wheel drive offers a considerable benefit when choosing a luxury sedan. With Audi's MMI system and up to 3 color screens inside the A7, the infotainment system is one of the best available.